Realize Rosslyn Plans must address "Intersection of Doom"
Realize Rosslyn is a major planning effort currently underway to update the Rosslyn Sector Plan. For over a year, the County has been holding meetings, studying travel patterns, examining viewsheds and gathering feedback from all sorts of people who live, work or play in and around Rosslyn. The current phase of the project has produced a draft policy framework which the team is currently gathering feedback on. This framework lays out the overall policy that will shape the final Sector Plan. The team has done some great work and the vision for Rosslyn is really coming together. Despite all of the great work in the Realize Rosslyn Draft Framework, there is one item that is conspicuously missing. Ask anyone who bike commutes in Arlington for a list of things they would like to see fixed in Rosslyn, and one item jumps out above all others. When I was gathering feedback in the Washington Area Bike Forum, it rose quickly to the top and is nicely summed up by Robert Cannon in the pictured post. Fix the Intersection of Doom. The infamous intersection being discussed is Lee Highway and N Lynn Street at the North end of Rosslyn just before Key Bridge. Pedestrians and cyclists connecting from the Mount Vernon Trail to the Custis Trail or from the Custis Trail wanting to cross Key Bridge have to go through this intersection. Passing through the same space is two lanes of traffic trying to exit I-66 and turn right onto Lynn Street in order to be able to cross Key Bridge. Both groups have a green light at largely the same time. Cyclists and pedestrians get a "leading interval" where the walk sign has turned, but the light is not yet green for cars, but without a "no turn on red" sign for the cars, even this period of time is not sancrosanct for the cyclists and pedestrians. The "doominess" of this intersection is not just anecdotal. According to Arlington County Police statistics, from 2009 to 2013, it was the #1 site for bicycle and pedestrian collisions. In 2011, there were three cyclists injured in a single week (1, 2 and 3). Make no mistake, this intersection is challenging to fix. 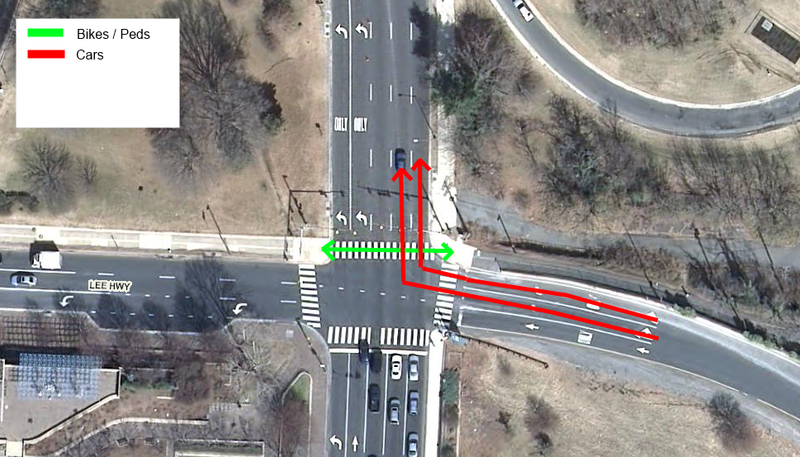 Arlington County, VDOT, the National Park Service and private individuals all own land right around this intersection. Any construction work in the area has the potential to significantly snarl bike, ped and auto traffic. There are viewsheds that people would like to protect, sensitive habitats, mature trees, and significant grades to be contended with. That said, a solution needs to be found - the status quo is cleary unsafe. The N. Lynn Street Esplanade and Lee Highway/Custis Trail Safety Improvements project is supposed to help the intersection, but it is not a long-term fix. It will improve sight lines, shorten crossing distances and provide some additional space for bikes and peds at this spot, but it will not fix the root issue - a large crowd of bikes, peds and cars all have a green light at the same time. In addition, it is LONG delayed. The last time their was a public meeting, construction was slated to begin in 2013. The current schedule has it beginning in 2015. The Rosslyn Circle Study examined ways to relocate the trail so as to avoid these intersections. The Rosslyn Esplanade Study examined the potential for tunneling under Lynn Street. Local blogger Steve Offut proposed re-locating the I-66 off ramp. Many folks think the proposal for an air rights development rights over I-66 provides a great opportunity to fix the issue. Whatever fix is decided on, what Realize Rosslyn needs to recognize is that their is a problem. It is great that the plan calls for new trails and cycle tracks, it is great that the plan calls for new parks and wider sidewalks, but the plan must also recognize that our current trail is unsafe and include a policy to implement a real, long-term fix. There is an Open House scheduled for tomorrow, Wednesday March 12th from 6pm to 9pm at the Rosslyn BID offices. Please go and tell them that any plan for Rosslyn for the next 20 years must address trail safety. The County Board will be voting on a "request to advertise" the Policy Framework at the Board Meeting on Tuesday March 18th meeting which begins at 6:45pm at the County Board Room in Courthouse. Please consider coming out and letting the Board know that this is an unacceptable oversight in the plans for Rosslyn. If you can't make it to a meeting, you can also send your thoughts to the County Board, the County Manager and the Principal Planner for the Realize Rosslyn Effort. 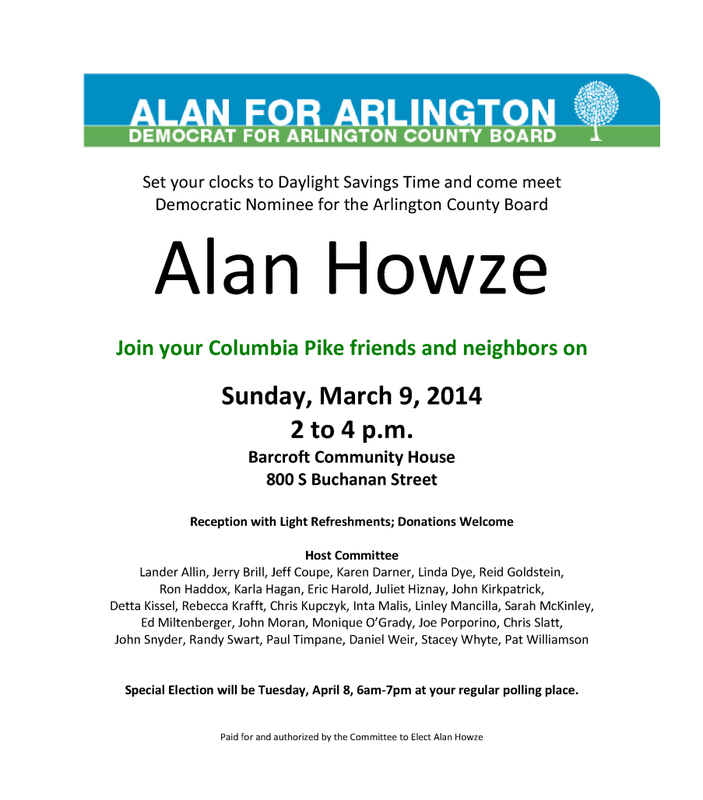 Please accept this invitation to come meet Alan Howze, candidate for Arlington County Board in the election to fill Chris Zimmerman's seat. Alan is a great progressive voice, community leader and strong supporter of the Columbia Pike Revitalization. The event is from 2pm to 4pm this Sunday (March 9th) at Barcroft Community House. See the invitation below for full details. "I've been asked by the County Manager to respond to your question about the status of Arlington’s snow operations plan vis a vis trail clearing. As you stated, staff did prepare a proposal last winter for the County Manager’s consideration that would expand the County’s snow clearing operations to include 13 miles of high-priority trails. Generally, the proposal was to fund, for a single winter, a test program that would have paid a contractor approximately $10,000 per snow event to clear 13 miles of priority trails. (During a typical winter – if there ever is such a thing – snow clearing operations are mobilized about ten times.) Thus this proposal would have reflected an approximately $100,000 budget commitment." "Given the County’s financial status at that time, it was decided that this could not be accommodated in the FY2014 budget proposal. Nonetheless, the proposal will be raised again during this next fiscal year’s budget discussions, taking place in the coming months. If the budget change request is accepted, I will be sure to brief the Bicycle Advisory Committee accordingly." If you agree that Arlington's Trails are important transportation corridors and should therefore be cleared of snow, please contact the County Manager and County Board to express your support. At best, perhaps this can be funded from the current fiscal year's closeout funds. At worst, let's start the pressure now to get this included in next fiscal year's budget. Trail plowing has been requested by Arlington's Bicycle Advisory Commission for years and was the subject of several blog posts and news articles last Fall. Please pardon a brief detour from my passion for Columbia Pike to my passion for cycling. Q by Me: Arlington often talks about how bicycling is an important part of our transportation network, and yet our bicycling infrastructure rarely if ever gets plowed, even major cycling thoroughfares like the Custis trail that continue to see hundreds of riders a day despite the weather. Minneapolis manages to keep their bike infrastructure plowed. When will Arlington? A: Currently there are no immediate plans to plow or treat primary commuting bike trails, but our planners, Department of Parks and Recreation and DES operations staff continue to strategize how to improve the bike commute. The County will be looking to coordinate with the Northern Virginia Regional Park Authority for priority to treat the WO&D Trail, which is not maintained by Arlington. Q by MB: I have to say that I'm pretty disappointed by DES' inaction on plowing our primary trails. As people within DES can tell you, thousands of Arlingtonians use those trails every day to get to work. By failing to plow the trails, DES puts more people onto the streets in cars. Is that really what you want, during a snow event? A: As previously asked by Chris, our planners, Department of Parks and Recreation and DES operations staff continue to strategize how to improve the bike commute. There are many significant safety and environmental concerns for bikers and our trails that we have and are attempting to find the best solution. • Remove all snow from bike lanes. • Clear snow from primary shared‐use paths (including the I‐66/Custis Trail and the Route 110 Trail) and make sure that snow banks do not block paths where they cross plowed roads. • Primarily recreational shared‐use paths, including Donaldson Run Trail and Lubber Run Trail, should be left unplowed for skiing and other winter use. The Bicycle Advisory Commission has brought this up regularly with staff over the course of several years and seen no progress. If Arlington is truly serious about walking and cycling as legitimate forms of transportation in the County they need to start treating walking and cycling infrastructure as transportation infrastructure not recreational amenities. If you agree, please take a moment to let the County Board know.